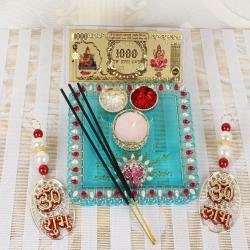 Product Consists: Attractive Designer Diwali Pooja Thali, Om Wall Hanging, Incense Sticks along with Shree Kuber Lakshmi Gold Plated Note. Diwali is the festival of lights happiness and togetherness. Let this Diwali bring the most happiness in every oneand#39;s life. 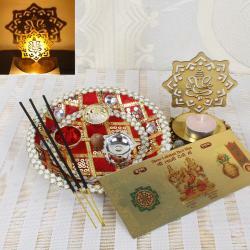 Praise the moment by sending Diwali Pooja Thali online to your love ones. 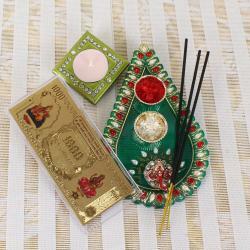 Giftacrossindia.com spreading love among your loved ones with this special Diwali gift hamper as this will become the highlights of festival. 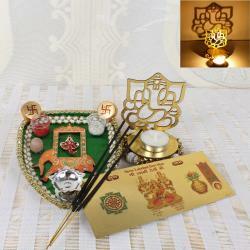 All prepare special pooja thali to perform every ritual of Diwali festival. Get the blessings of Lord Kuber with Devi Lakshmi by gifting this gold plated note. Diwali is one of the most awaited and grand Hindu festivals, celebrated in all over India as well as in World too. Celebrate the beautiful bond of love and lighting festival which you have share with your adorable love ones through us with this unique religious Diwali Pooja Thali.